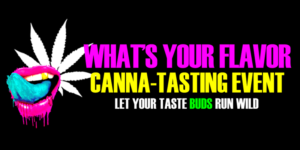 Let your taste buds run wild at Whats your flavor! . Indulge in a uniquly delicious, full canna-tasting experience. The Nation’s Capitol is growing immensly in relation to Cannabis. Initiative 71 has inspired many talented Ganjaprenuers and Canna-Chefs to develop incredible products! What’s Your Flavor! Brings you a chance to access those premium items exclusivly! Join us as we create an unforgettable experience that goes beyond your guests’ expectations.